Occasional reports of this kind reassure the public that honesty still prevails and confirms the belief in basic good nature in human beings. For AamirRaza Nazirahemd Hunaskatti (37), honesty is the best policy. That’s why instead of keeping a Rs.1 lakh left by passenger in his auto, he returned it to the Commissioner of Police as he did not know whom it belonged to. 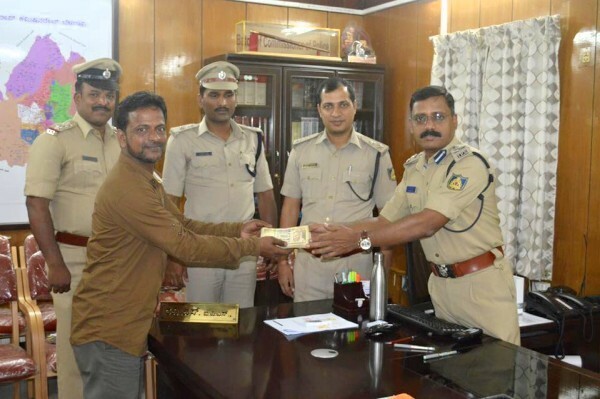 As his name Aamir, which means a Prince, he acted also a prince and returned the money to Khade Bazar Police station. On earlier occasions as this auto driver had returned the valuables left over in his auto by the passengers which included gold ornaments. This AAMIR man stays in Azam Nagar and hails from a poor family but his honesty has made him richer than richest. He has 5 children and his wife does not keep well, but even after such hardships he thought it best to be an honest man. Salute to his honesty. Comissioner of Police has felicitated him with a certificate and now is looking for a A philanthropist to help out this man? And also searching for the Owner of this huge amount? Great Job Sir, Please take a step towards leadership and first become the the leader of Belgaum auto association and then for the Belgaum elections. Vey well done, may Allah (swt) reward your honesty n humanity ! Despite all the hardships in his family, the courage and conviction shown by Aamir Raza is exemplary. Request all honest minded people to come forward and help a genuine, honest person. The efforts of the Commissioner of Police is laudable.